At a Catholic boys' school, domineering disciplinarian Father Goddard (Richard Burton, Look Back in Anger, The Spy Who Came In from the Cold) rules over his pupils with an iron hand. When one of his teenage charges confesses to murder, the dogmatic but deeply repressed Goddard finds his faith challenged and his life spiralling dangerously out of control. 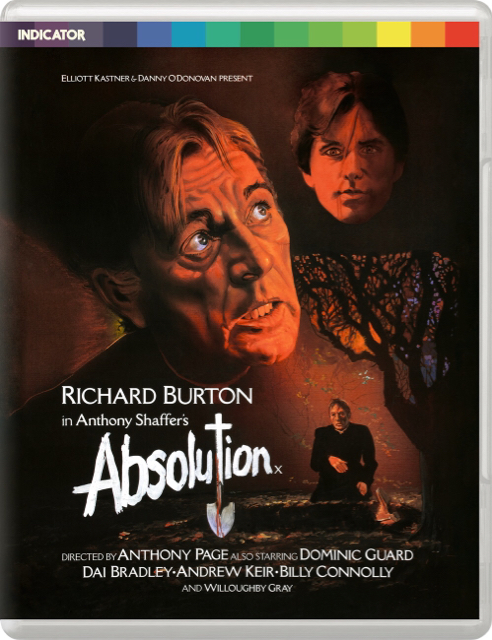 Also starring Billy Connolly (in his first feature-film role), Dominic Guard (The Go-Between, Picnic at Hanging Rock), Kes star Dai Bradley, and the inimitable Brian Glover (Kes, Jabberwocky, Alien3), and written by the great Anthony Shaffer (The Wicker Man, Sleuth), Absolution is one of British cinema’s most underrated chillers, not least for a towering central performance by Burton. Powerhouse website now specifies 2k restoration. This seems to have been updated recently. A typically exhaustive appraisal from CineOutsider, although I strongly disagree with his recommendation to watch the theatrical cut first. If you're watching the film for the first time, the director's cut is a tauter, pacier and generally more involving piece of work precisely because it cuts out the irrelevant/misjudged stuff whose omission the review is complaining about.